Time for a little home renovation, mixed media style. 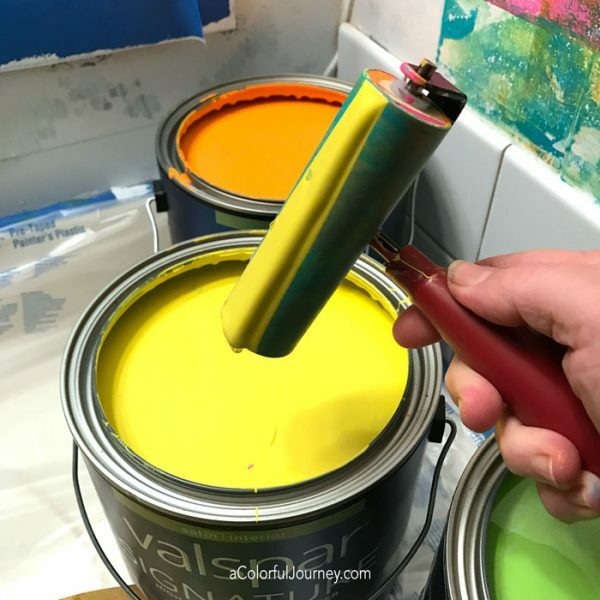 I bought 5 gallons of house paint in the colors of the rainbow, grabbed a Gel Press monoprinting plate and started printing right on the walls. Yes, I did it directly on the wall. Slapping it right against the wall makes the most wonderful thwap sound! Shockingly, there is an OOPS when I am printing at 2:12 minutes into this. And I love that OOPS! 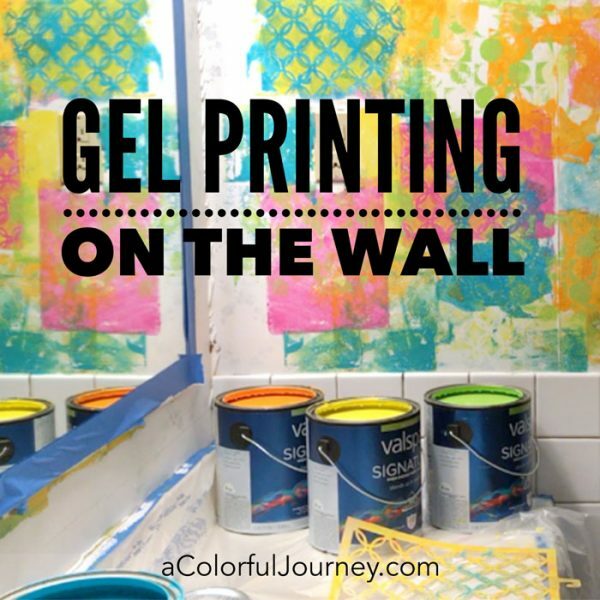 Watch How I gel printed on the wall on YouTube. 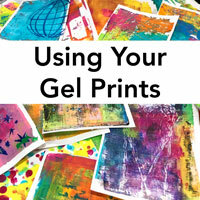 If you’re new to gel printing, I created a getting started video here and downloadable guide so you can have it right next to you as you’re printing. Under that white paint, is the ivy lattice wallpaper from 20 years ago that has been starting to peel off at the edges in this guest bathroom. But I never wanted to deal with it until I began to wonder if I could gel print directly on a wall. Suddenly, I this bathroom redo I had been putting off became top priority. So why didn’t I peel it all off before doing this? That pesky prep work isn’t nearly as much fun as slapping a gel plate right on the wall so I just left the old wall paper up there and painted right over it. I have an idea for how I am going to deal with the peeling edges mixed media style in upcoming layers. 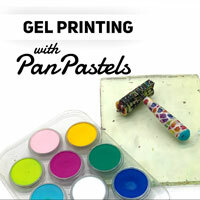 With gallon paint cans, it was easy to dip the brayer right in the color and get it on to the gel plate! When I bought the paint, the woman next to me asked how many rooms I was painting with all these bright colors of Valspar paint. The look on her face when I said all 5 were for the same room was priceless! Here’s the wall with layer #1 on it. Completely imperfect, just like one of my art journal pages. This is an ongoing project that will have layer after layer added to it, just like an art journal page. Of course, I’ll be sharing the progress with you via the newsletter and blog. Not signed up yet? Just click the button below to join the fun! Yes, I Want to See What Happens! Here are the supplies I used. Some of these links are affiliate links which means I get a small percentage. It doesn’t cost you anything extra and you are helping me keep this blog and my videos ad free! Thank you- I don’t like ads any more than you do! The house paint is Valspar from the hardware store. You never cease to amaze! My newest mantra is “It’s just paint!” If you end up liking, loving, or get tired of something….just get the paint out! Bold colors to make a few of us stretch our horizons. I have also found that there are ways to paint the light plate switches and outlets to blend in….it’s just plastic! Ha! Have fun and we await more results. First trash cans, now this!!! This is sooooooo you!!! Love it, love it, LOVE IT!!!! I love this! So much fun. Love love love this! Thank you for sharing! This is freaking awesome!!!!!! It would make me want to get out of bed and face the morning!!!!! Wow! I think my DH would not be at all happy if I did that to a wall. Looking forward to seeing what happens next. Holy Smokes.. what the heck. You word for the day is BRAVE!!! Woohoo… that was fun to watch. As each layer was built, I liked it more and more. Are you going to keep it? You always make me LOL and smile big!!! Can’t wait to see how this comes out, it’s already quite amazing. Those colors are beautiful! Wooooowww!!!! This is a fabulous idea!!! OH, Carolyn! You are SO much braver than I am! It’s only paint, right? If you really don’t like it, paint over it. But I don’t think that’s what will happen in the end. You inspire me to play without letting the little voices control me. I’m off to play, in my art journal, not on my walls, yet! I LOVE this! 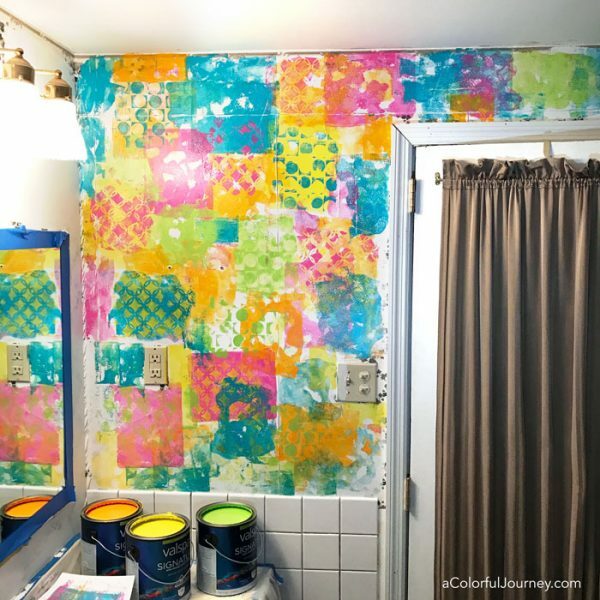 I have been thinking similar (painting a bathroom bright colors), but the gell plate with stencil is amazing! And fun! I have home made plates, so ones a circle… I might just start with one area/wall. But this summer I got brightly colored rugs and towels from IKEA. They would totally match. They have solids, but this one is fun. The toothpaste tube looks like a paint tube!http://m.ikea.com/us/en/catalog/products/art/70296084/ Can’t wait to see the finished wall. Thanks for sharing. So fantastic! I can’t wait to see how it all turns out! Oh Carolyn, this is so you. I loce this, but its just not me for my small bathroom. But you have given me a great idea. Take the 3″X5″ plate and make a border, both at the top of wall and at the bottom by the baseboard. I love altered art and all that you do but not sure I’d like it all over the wall in MY bathroom. LOL Keep the ideas coming. Thank you Carolyn, I have a bit of wall in my “crafty corner” that has been waiting for something like this. Yoohoo, I am going to the paint shop right now. You are brave!! Can’t wait to see what you do next in there. What FUN! I think I’ll try it on the wall leading to my studio in the basement! Hmm, maybe even get a couple of my friends and even my husband to play! 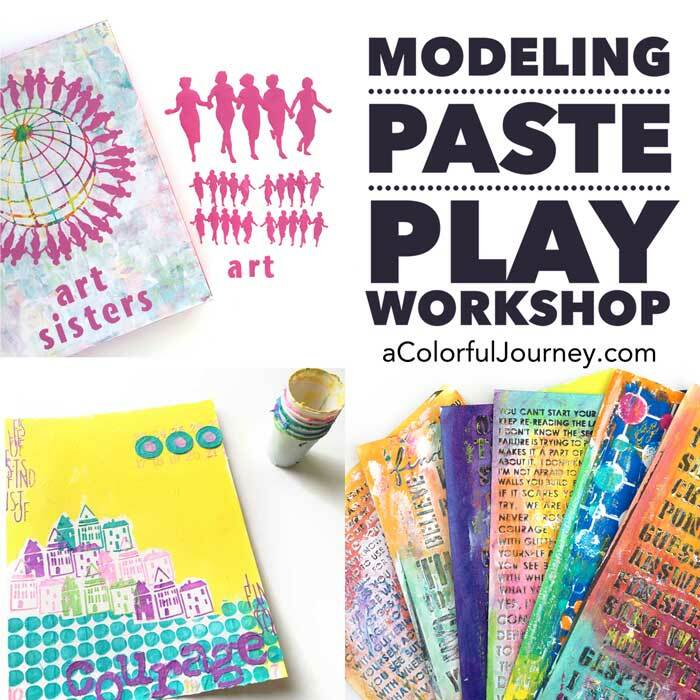 Most of my friends haven’t tried gelli plate printing so it should be FUN. 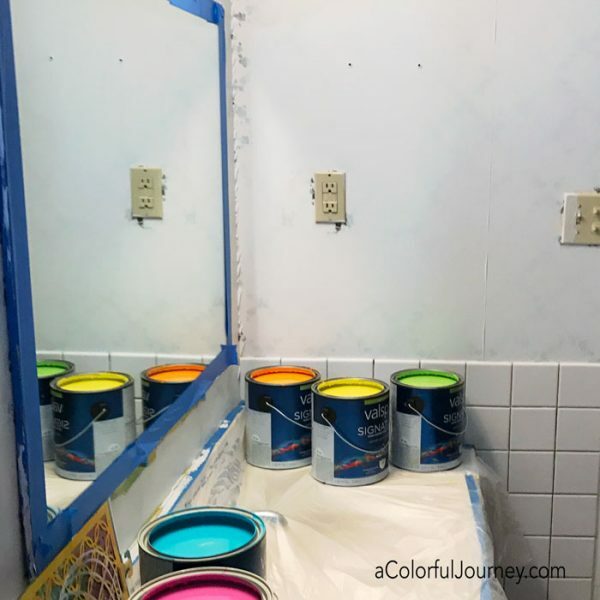 We’re planing a trip to the hardware store this week & I can get some of those sample paints! Wow! You are brave and fearless. I felt so free watching you paint. And btw, it is just paint and if you hate it , it can be covered up with another layer. Its seeing you do something that others wouldn’t even attempt. 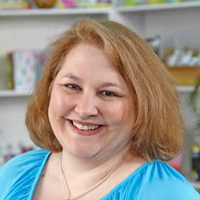 You truly rock Carolyn! This was more than a how to paint, it was a how to trust, be confident, be free, be bold, be unafraid. So GREAT!!!!!! Looks great, mmm wonder how it will work on the garage door? ? Hope you got the paint on sale! I think I like it already. Certainly one of a kind! A girl’s just gotta have fun! Genius! 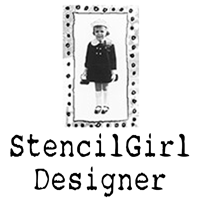 I have a concrete block (cinder block) craft studio, which is (badly) painted white inside. Not for much longer! I think I will use my home-made gel plates first though, to make sure the rough surface of the wall doesn’t damage them. Carolyn i love your laid back style 🙂 I think the gel print painting on the walls is a great idea. And it is becoming a lovely, colorful space. I am really curious about the upcoming tile painting part. You are giving me all sorts of naughty ideas to try on my bathroom walls 😉 Thank you for the inspiration. 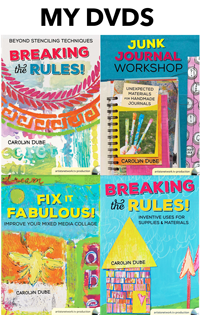 Carolyn you are so creatively colourful. Most people would not like all that colour on their walls, but I personally love it!? You are making a bold and colourful statement and are living up to your Colourful Journey. ?